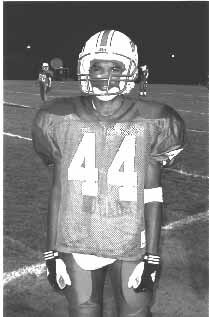 During the summer of 97, I had decided to join the football team because I had found this sport very interesting. Its also physical and very challenging. However, there was a physical exam that I had to take in order to tryout and be on the team. I was very nervous that day. I thought that I might be too weak to play football, especially for someone of my size. Anyway I managed to pass the exam and at the end, the doctor told me that I was finally ready to tryout. The next day, when I went to practice. I was scared to death because I had found that all the people who were on the team were very big and very strong. Everybody was telling me to go home to avoid being injured. They thought that I couldnt make it. When we were tackling each other, I couldnt hit anybody because I was too weak and too small. I was always getting hurt and people were making fun of me all the time. They told me that I should quit but I never listened to them. I kept on doing my best because I had never played football before. My coaches were very kind to me and they brought me to the weight room for me to get stronger. I worked out every single day and finally, I got strong enough to play football. Today Im on the varsity football team and Im proud of myself because Im a good student athlete. I want to thank one person who helped make my dream to join the team come true. Before I came to the U.S. I wanted to play football for one of the high-schools that I would go to. However, once I got here I thought that no matter what I did, I would never be on any football team. Despite what I thought, somebody managed to tell me that it was all right and I could do anything as long as I believed in myself. This person used to be, not just one of my teachers, but also one of my true friends. Her name is Mrs. Carrie Demers and she was always there when I needed a hug or I needed to talk to someone. She made me believe in myself. Probably the reason why Im a student athlete is because of everything she taught me. She was like a mother to me and I hope that Ill see her one of these days to give her a hug and tell her how much I miss her because shes not at Blair anymore. Her kindness was a very special blessing and I would like to tell her thank you.